By definition, paroxysm means any sudden, violent outburst. In my mind, with summer just around the corner and today being Father’s Day, it’s time to break out the summer dishes and just let the flavors explode all over the palette. So, given that definition, I think paroxysm works well in my title! 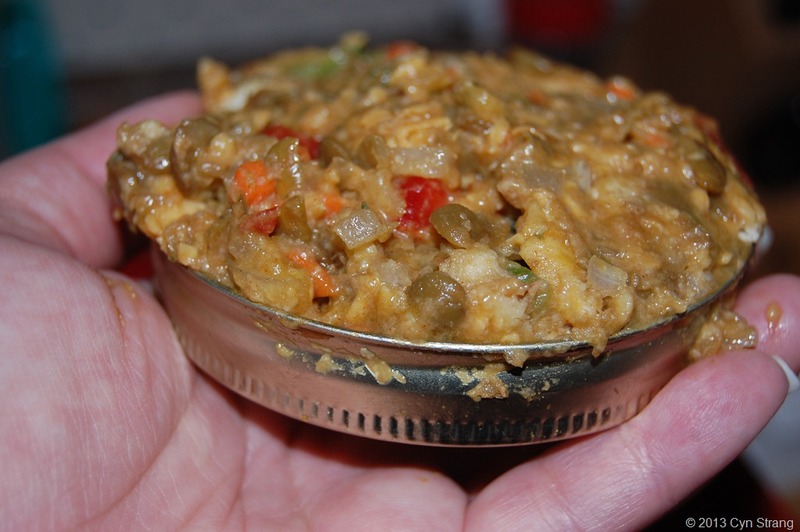 Today I am trying two comfort food dishes that include pimentos but changing it out a little. Pimentos are just chopped up red peppers that can be pickled and smoked. I love the flavor they add to dishes and the color just adds a beautiful pop to any dish! 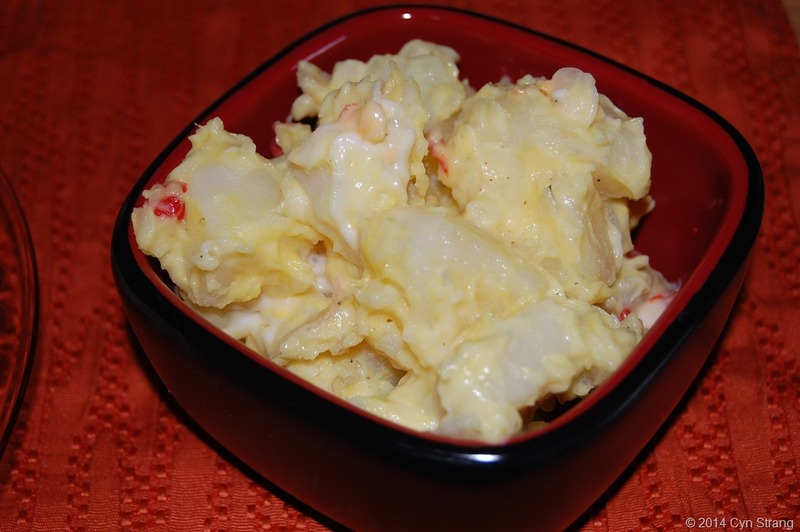 The first dish is a revamping of my favorite summer dish: potato salad. 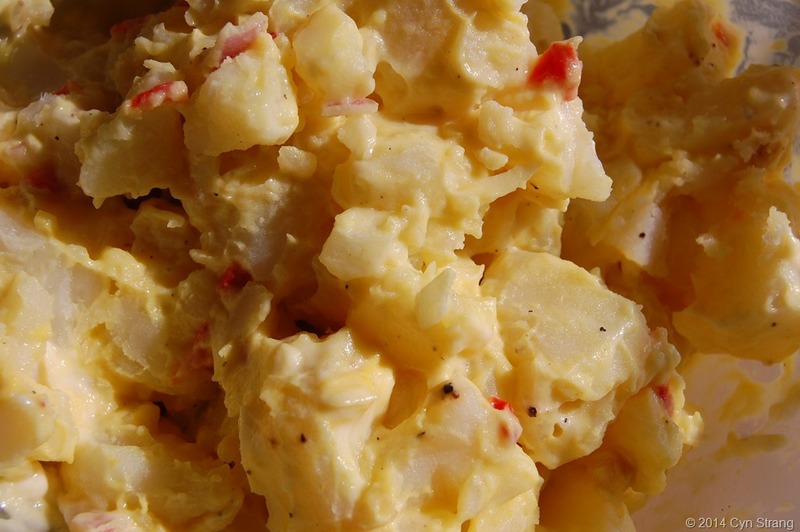 Who doesn’t love potato salad on a hot day? There are so many ways to make this dish, but I just kept it simple using what I had in the pantry. 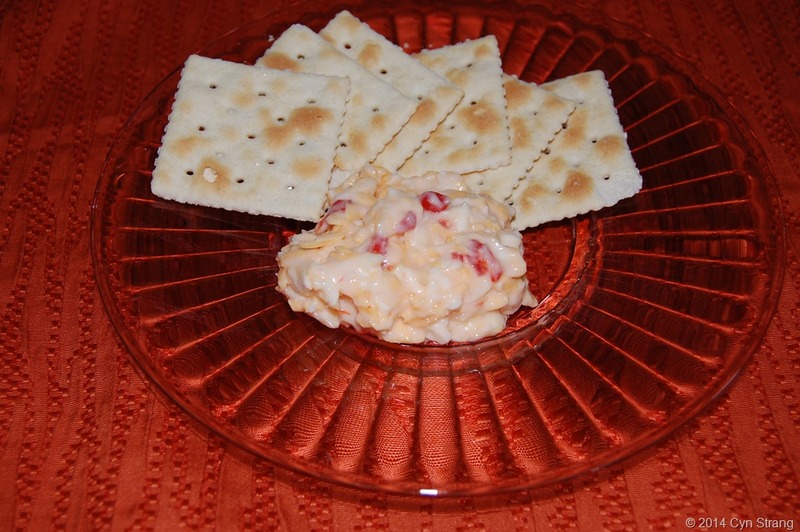 The second dish is: pimento cheese spread. Another dish that has fifty million different ways of making it, I again chose to keep it simple and the recipe is based on one from a co-worker. First step: peel and chop potatoes. Probably the least fun part of the whole thing! I took 5-6 large Idaho potatoes, because that’s what I had in the kitchen! After peeling and washing them, I put them into a large bowl of water. It’s been said that soaking them in water will help remove some of the starch. I guess it’s true, because when I came back a little later to chop them, their texture was very different! Second step: cook the potatoes. In a large pot of salted water, boil the potatoes until just softened. 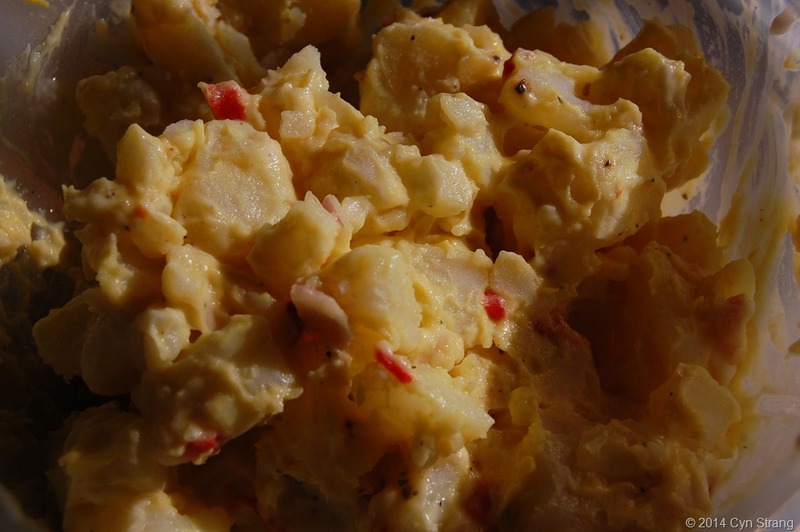 You don’t want to overcook them because the potato salad will be mushy. Once cooked, drain and rinse the potatoes. Rinsing them helps to stop the cooking as they will continue to cook until cool. For the sauce, you will need your favorite mayonnaise or salad dressing. To keep it vegan, use Veganaise or another similar vegan mayo. I had some light Miracle Whip on hand and decided to just use that. Next add some yellow mustard, freshly ground black pepper, healthy pinch of paprika, pimentos, shallots and some Vidalia onion. Mixing it all together, chill in the refrigerator for a few hours or overnight so the flavors meld together. See the recipe below! Peel and soak potatoes in a large bowl of water for about 20-min. While they are soaking cut the Vidalia onion, purple shallots and place in a bowl together with all the other ingredients. One the potatoes are chopped, cook until just tender in a large pot of boiling salted water. Drain and rinse to slow the cooking process. Toss altogether and chill in the refrigerator for at least an hour or overnight so the flavors will meld. Now for the second dish! 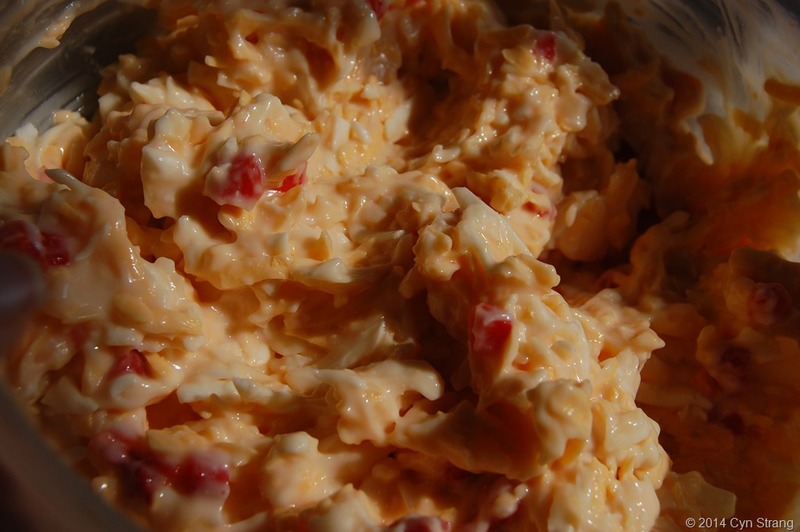 I love pimento spread, but sometimes the store-bought has so many extra ingredients in it and while I like cream cheese, using it in pimento spread makes the spread so much heavier, in my opinion. This recipe was inspired by a co-worker who brought in her pimento spread for a birthday party luncheon that we had recently. I basically followed what she told me, except for the choice of cheese. She uses Velveeta process cheese and I chose sharp cheddar. The end result is basically the same = creamy, light, flavorful. Perfect. Doesn’t that close up photo just make you want to dig in?!? 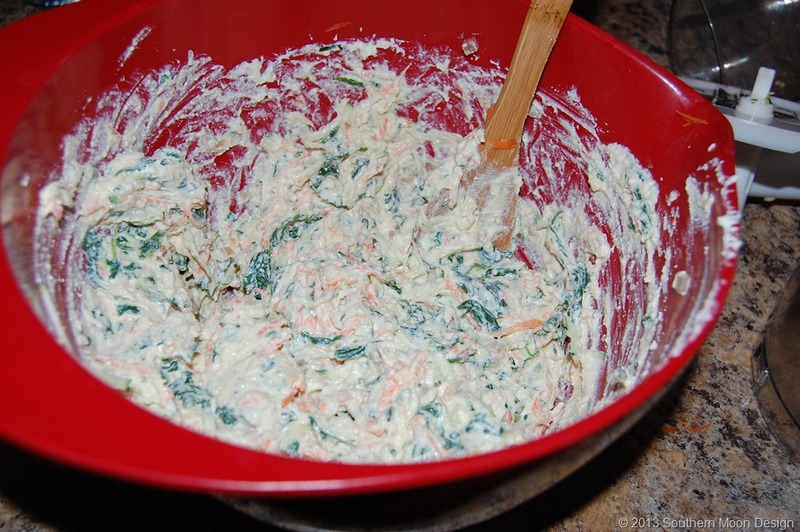 Mix all together in a large bowl until well combined and creamy. You may have to add more mayonnaise or salad dressing until it’s the right consistency. Chill for at least an hour to allow the mixture to set. Serve on bread or crackers or use as a dip with your favorite dipping chips. This is probably my favorite time of year when it comes to fresh food. Gardens are in full swing and every weekend weeds must be evicted from them. Despite the weeds, the bounty that a garden yields can last the rest of the year if planned in advance. The other day a friend of mine gave me a big bag of zucchini and summer squash from her garden. 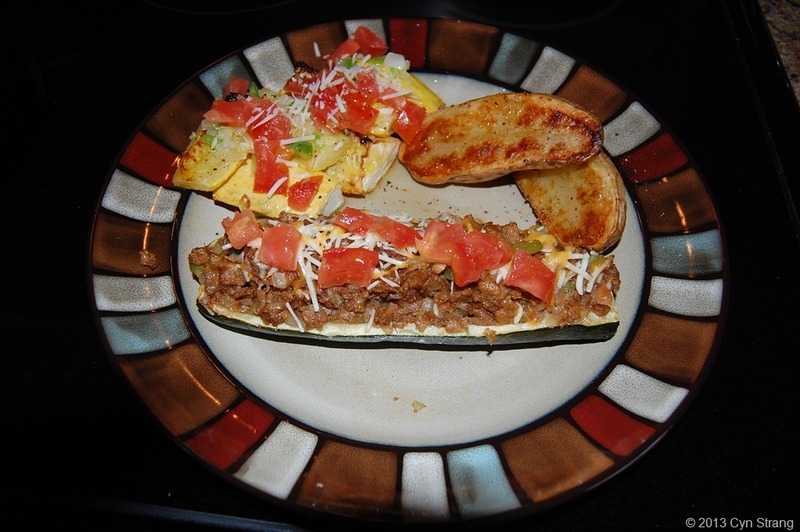 And while watching my weekly recordings of cooking shows, I was inspired by Jamie Deen’s zucchini boats. 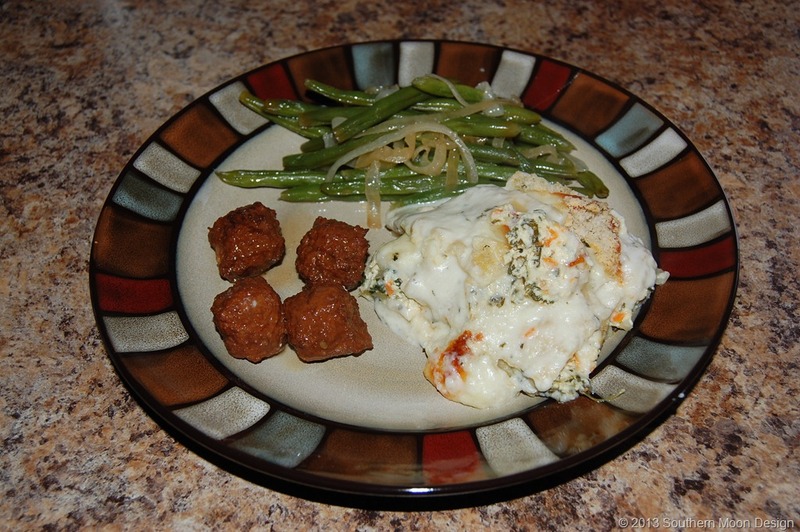 He stuffed his with Vidalia onions, sausage and tomatoes and cheese. Mine are a vegetarian version, but all in all, they are so good that it didn’t take long to wolf mine down! 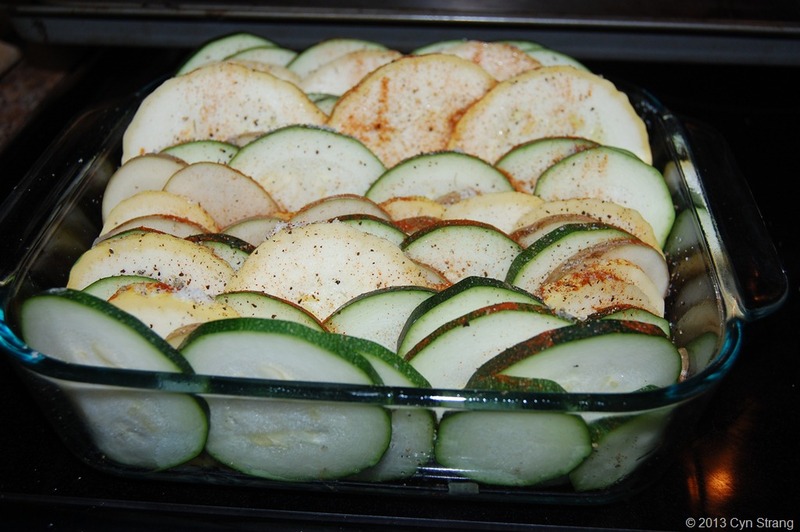 Begin by roasting your zucchini in the oven. 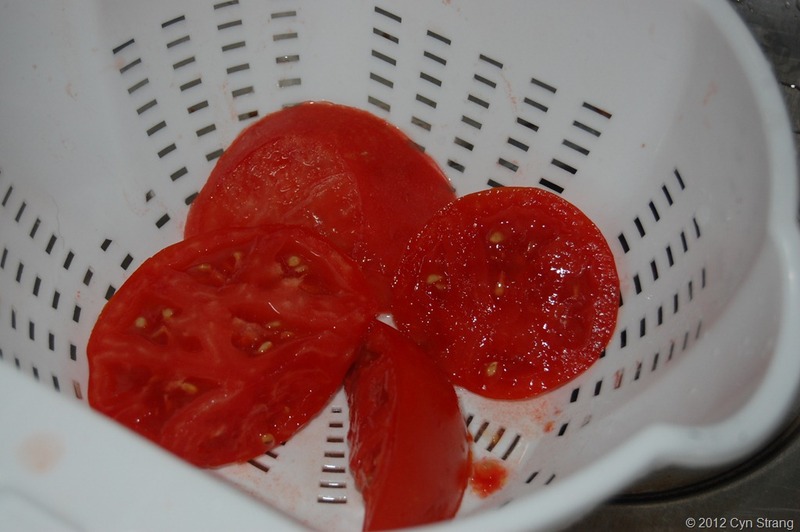 Wash and cut them lengthwise – I snipped of the stem ends as well. Spray your baking sheet with non-stick spray then drizzle a small amount of extra virgin olive oil. 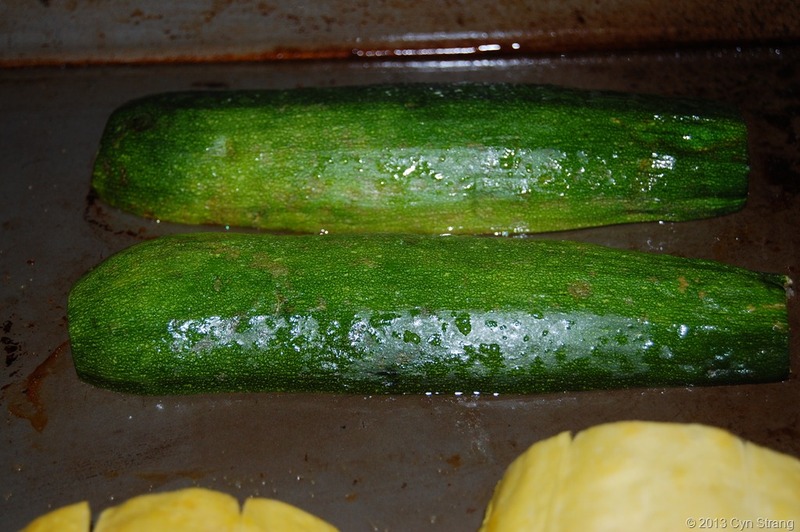 Lay the zucchini flat down, sprinkle a little grey sea salt over them and roast just until tender. 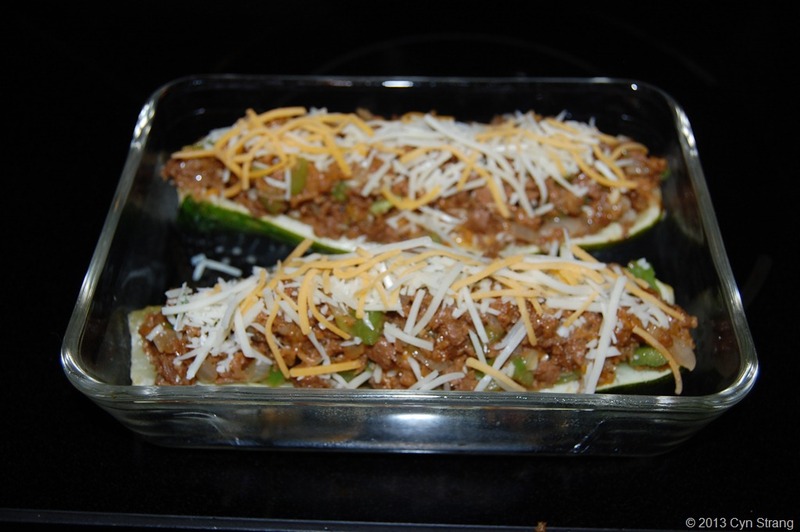 Set the zucchini aside for a few minutes until cool to the touch. Using a small spoon, gently scrape/scoop out the center until they resemble long boats and set aside. See the photo above. While these are cooling, get your stuffing ingredients together. Finely dice a Vidalia onion and sauté in extra virgin olive oil. One the onions have sweat and turn clear, add the finely diced sweet bell pepper. 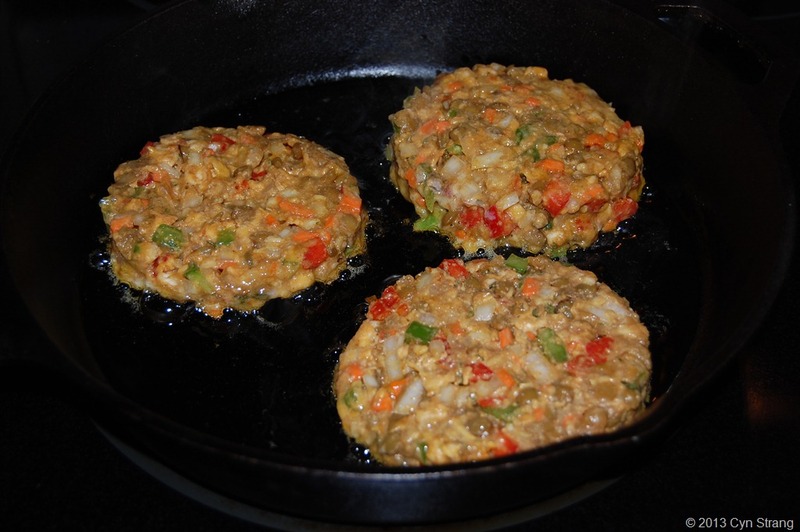 Then add your veggie burger or other choice of meat. Add a pinch of onion powder, a couple shakes (dashes) of Worcestershire sauce. Cook until meat is done. Add a pinch of grated parmesan and cheddar cheeses and a handful of Panko bread crumbs. Stir together and begin stuffing the zucchini boats. Return them to the oven and bake until the cheese is melted and bubbly. I served these alongside roasted potato halves and yellow squash that I topped with diced up fresh tomatoes and a little parmesan. The actual recipe is below. Keep in mind that the measurements are approximate as I do not measure when I cook. Set oven to 350 degrees Fahrenheit. Wash zucchini well, trim off stem ends and cut lengthwise. Spray baking sheet with non-stick spray and drizzle with olive oil. Lay zucchini face-down and sprinkle lightly with a pinch of grey sea salt. Roast until just tender. Remove from the oven and let cool to the touch. While still warm, using a small spoon, scoop out the centers making boats. Set aside. 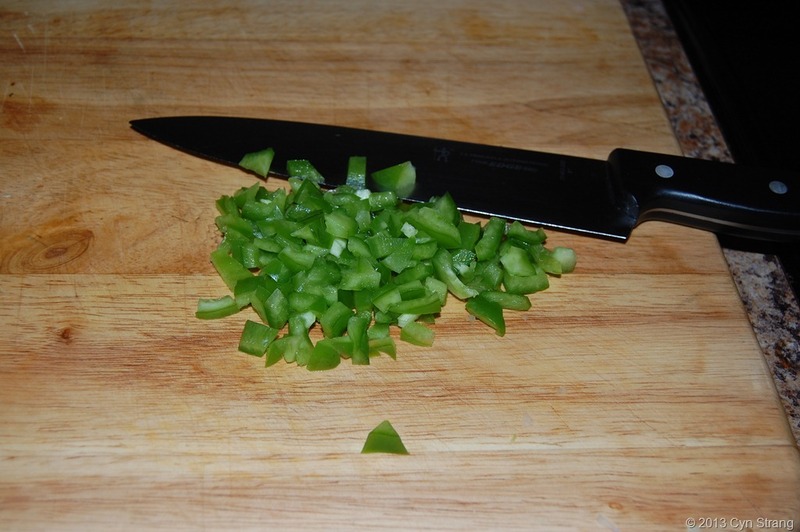 Sauté the onion and green bell pepper in extra virgin olive oil, add meat of choice and cook thoroughly. Add a handful of Panko bread crumbs, big pinch of grated cheddar and grated parmesan cheeses. Stir well and let cheese melt a little. 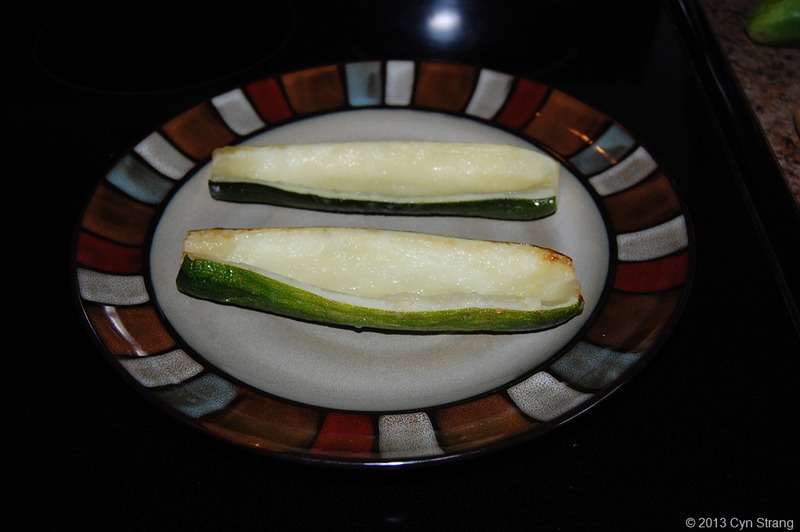 Spoon into zucchini boats and top with a sprinkle of grated parmesan and cheddar cheeses. Put back in the oven and bake until the cheese melts. For serving size, you can have one big zucchini half or two small halves per person. What is tian, you ask? 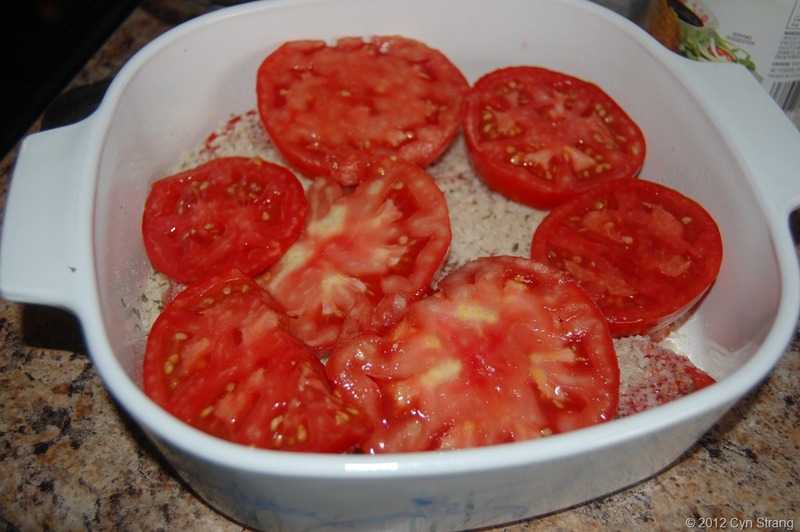 During the summer there are plentiful tomatoes, zucchini, eggplant and many other summer foods in abundance. Provencal cooking celebrates the traditions of France’s countryside. 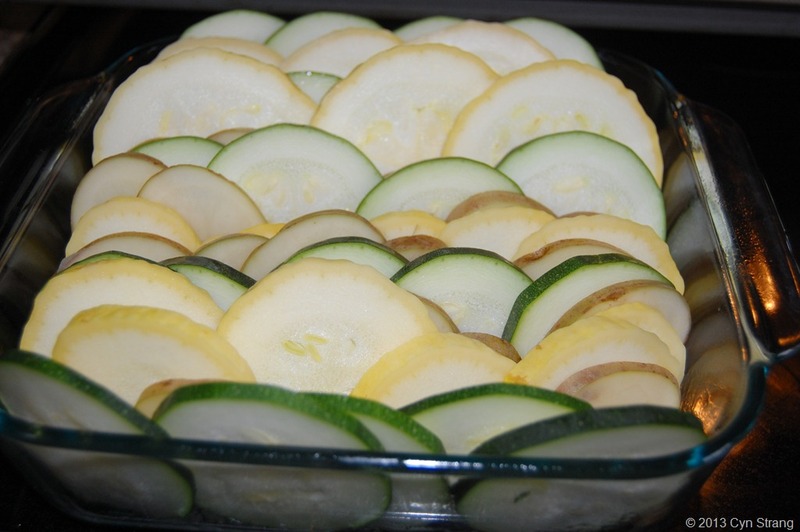 And a tian is a layered baked vegetable dish that originated in Provence. 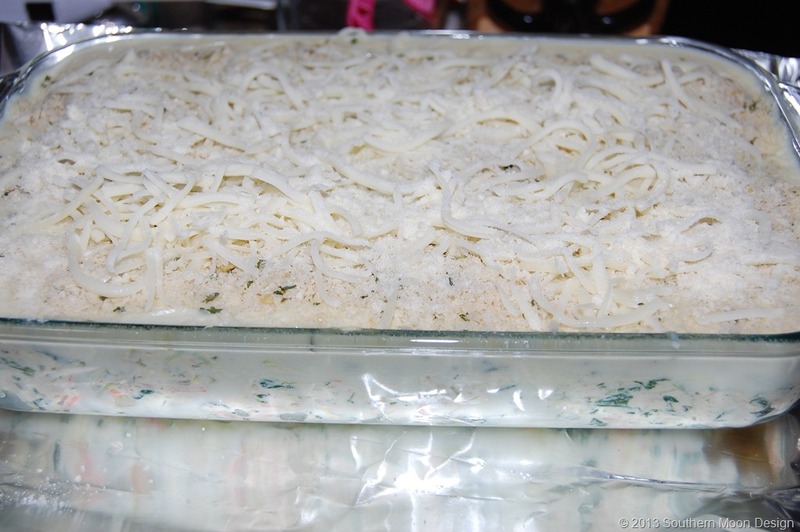 Unlike a gratin, a tian does not include bread crumbs or cheese, which allows the juices of the vegetables to evaporate, thus allowing a deep concentration of the flavors. Tian is usually served around the holiday Bastille Day during the peak of the summer when all the vegetables are readily available. While I didn’t have all the ingredients of a traditional tian, I made my own version of it with the vegetables on hand and it was delicious! Some tian calls eggplant, leeks, zucchini, plum tomatoes but I think you could take any of the summer vegetables that you enjoy and make this dish. 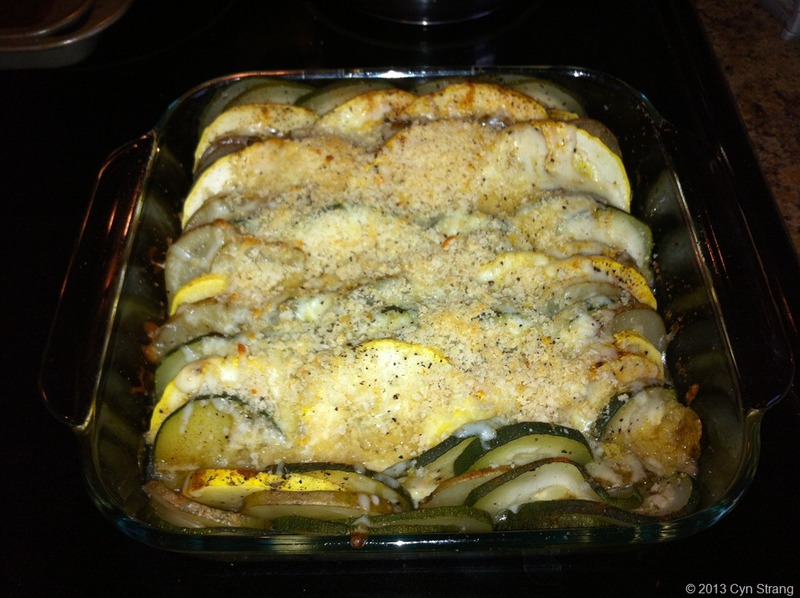 I only had summer squash, zucchini and potatoes on hand, so that along with onions and garlic is what I used. The simplified recipe that I found follows at the end of this post, however, there are many more authentic recipes that can be found online. First gather together the vegetables that you will want to use. 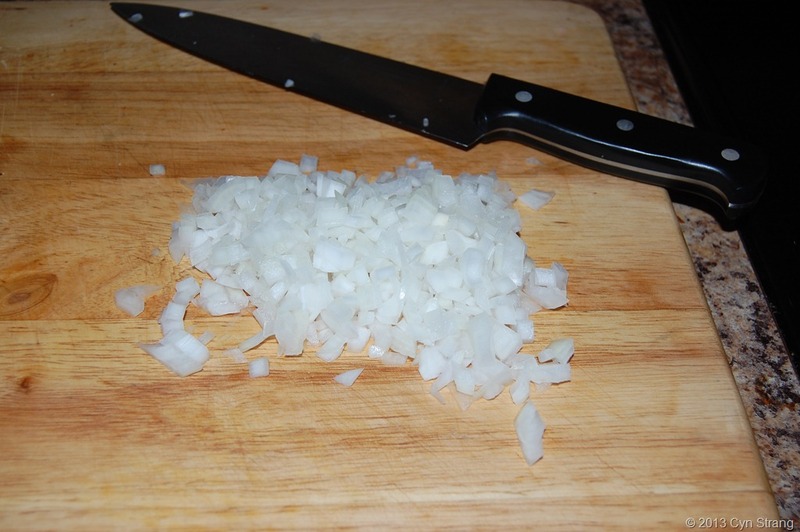 Finely chop your onion and sauté in extra virgin olive oil, adding your garlic at the end. I pushed 2 large cloves of garlic through a press. While your onion and garlic sauté, spray an 8×8″-inch square baking dish with non-stick spray or lightly butter and set aside. Next, thinly slice all your vegetables, potatoes, whatever it is that you will be using. 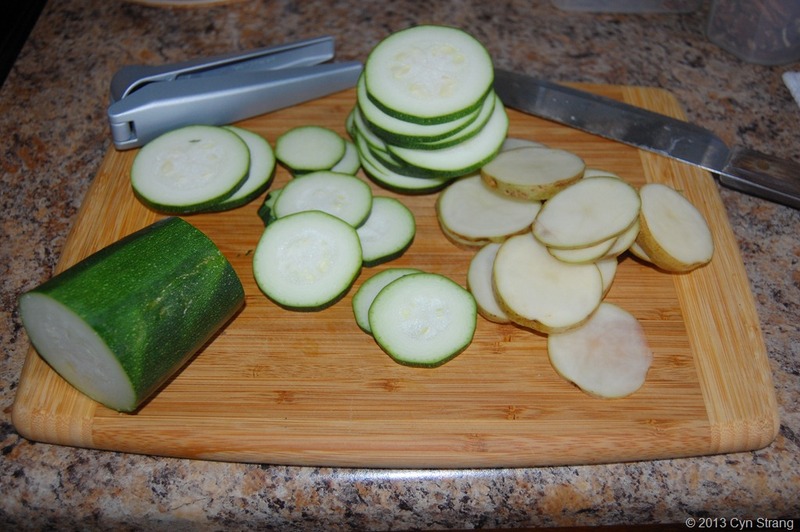 Since I used zucchini, summer square and potatoes, I sliced them into thin coins. And since many vitamins and nutrients are found close to the skin, I did not peel my potatoes. I just scrubbed them really well when washing. A friend of mine has an overabundance of vegetables in her garden this year and was nice enough to give me some and that is what I used in this dish. 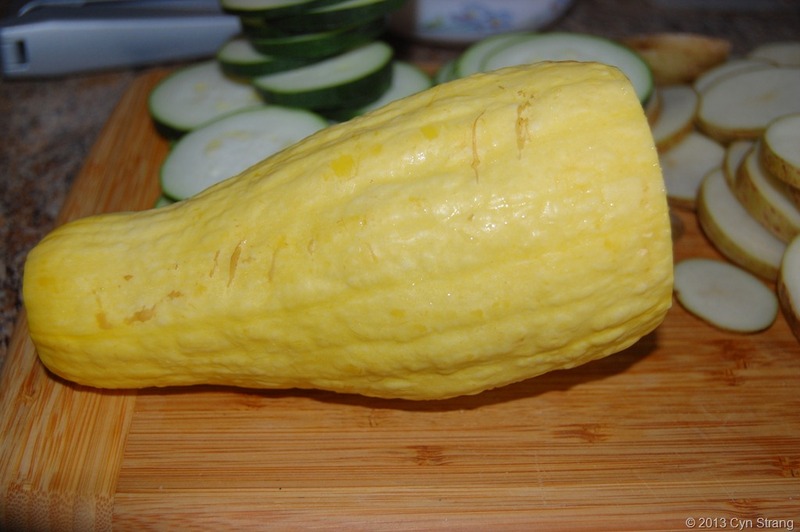 Look at the size of the summer squash! Spread the softened onion and garlic sauté into the bottom of the prepared baking dish. As you can see, the steam fogged up my baking dish! Now take the thinly sliced vegetable coins and neatly stack them, alternating between each veggie per row. I stacked my vertically for a different look. If you are using a round dish, layer in fans, working from the center. Either way, it makes a beautiful display. Sprinkle with sea salt (I use Celtic Gray Sea Salt), freshly ground black pepper and thyme. Now since I did not have any thyme, I used a little pinch of sage. And because I like it, a nice sprinkle of paprika. Cover the dish with buttered parchment, or foil if you have that. Bake in a 400-degree Fahrenheit oven for 30 minutes or until the vegetables are tender. You can then add a sprinkling of cheese and bread crumbs if you wish, especially if you have kids or picky eaters in the house. Traditionally this dish does not include it. Preheat the oven to 400-degrees Fahrenheit. Finely dice the onion and mince the garlic. Sauté both in a skillet with extra virgin olive oil until softened. While the onion and garlic sautés, thinly slice the rest of your vegetables. 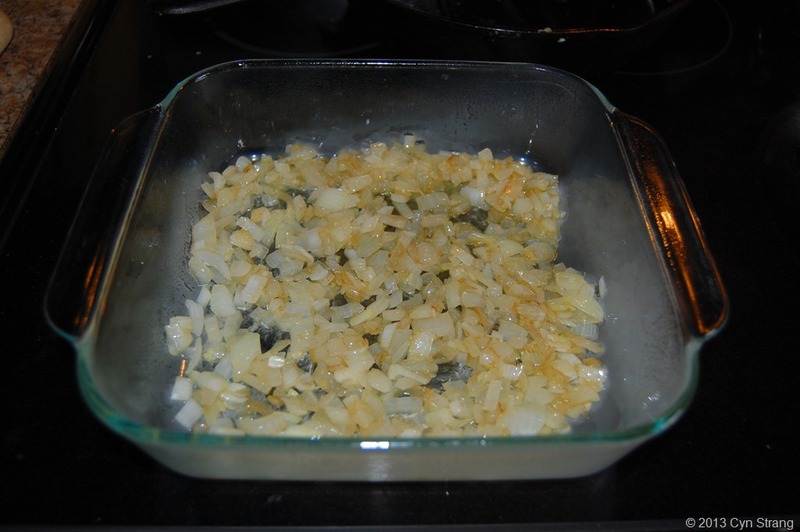 Spray your baking dish and spread the softened onion and garlic in the bottom of the dish. Arrange the vegetable slices, alternating them, in vertical rows. Sprinkle generously with sea salt and fresh ground pepper and thyme. Cover and bake for 30 minutes until tender. 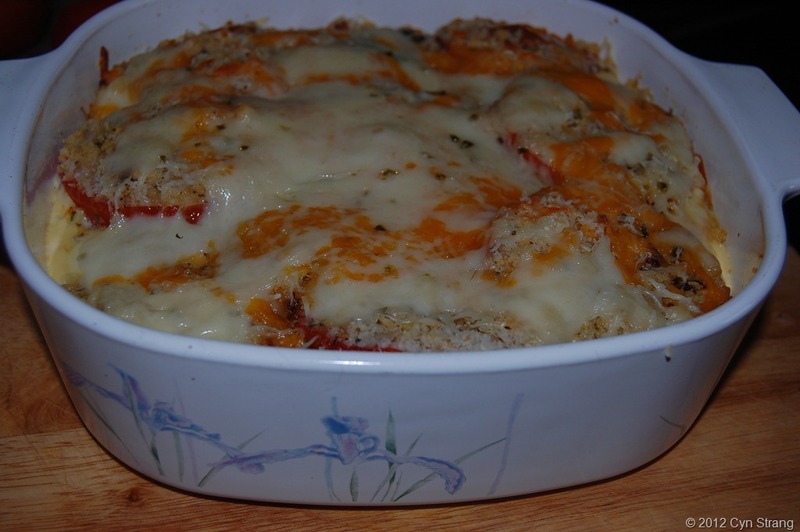 Top with optional cheese and bread crumbs and bake until the cheese is golden brown. Serve as a delightful side dish with rice or noodles and your choice of main dish. Growing up, my diet was very strict and completely vegetarian. While some may turn their noses up at such a lifestyle, many more are now adopting a plant-based diet as they attempt to be the healthiest that they can be. More people realize that a diet rich in plant-based foods with less emphasis on meats is actually better for you. 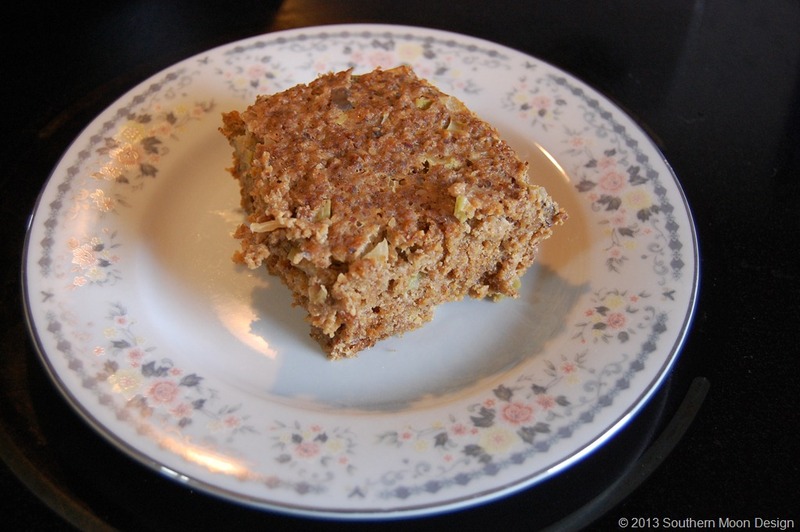 This recipe is about 35+ years old, so there can be a lot of tweaking to bring it up to date. Further, I personally know that earlier vegetarian recipes were often loaded with ingredients that a strict vegan would not consume and sometimes are not the healthiest of options either. However, the flavors in this loaf are so full, that it makes a wonderful addition to any meal!Try this entrée on your next Meat-Free Monday! You may find a new dish that your family will enjoy! Combine all together in a large mixing bowl until well mixed. Pour into a greased loaf pan and bake at 375F for 45 minutes to 1 hour. What I like most about the flavor is the crunchiness of the little celery bits and the full bodied nuttiness that the pecans provide. 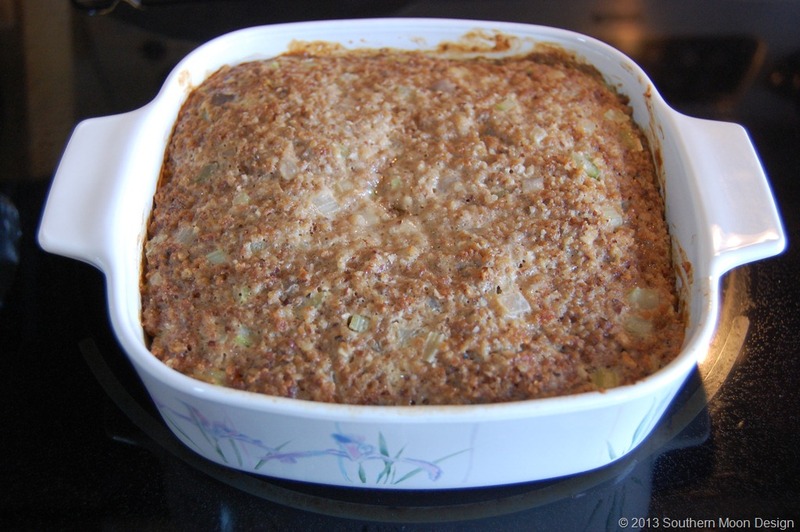 Serve it like you would regular meatloaf and it’s also very good with a light brown sauce/gravy! It’s also good by itself! Digging through my fridge, I came across some bits and pieces of items that needed to be used up and decided it was time for some homemade veggie burgers! Since we had lentils a couple days before, it just made sense to use up the little bit that was left. If you keep your refrigerator stocked and your pantry stocked with certain staples all the time, you can create something “new” for dinner! So, as you may already know, I don’t measure when I cook, so these measurements are approximates and you may need to adjust for your taste. 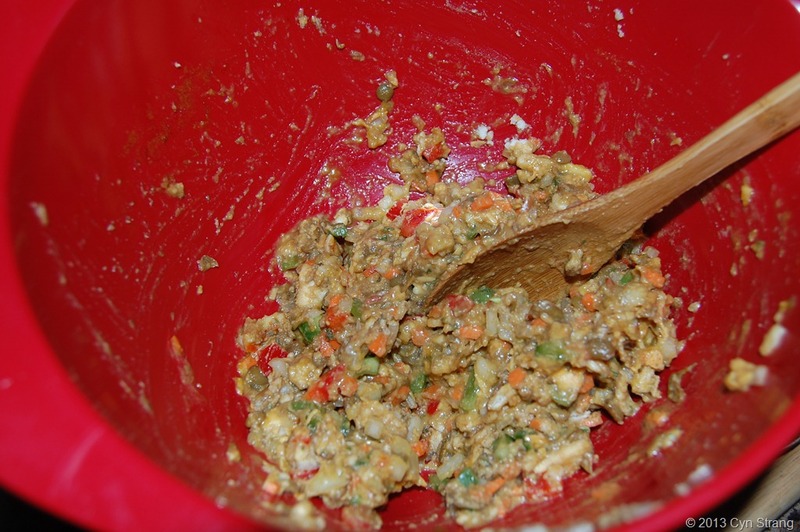 In a large bowl (see photo above) mix together all the ingredients until well blended. Taking a quart size canning lid, spray with non-stick spray. Spoon patty mixture into the canning lid. Press into the lid to shape the patty. Turn into a heated cast iron past that has been lightly oiled with pure extra-virgin olive oil. Cook on each side until lightly browned. 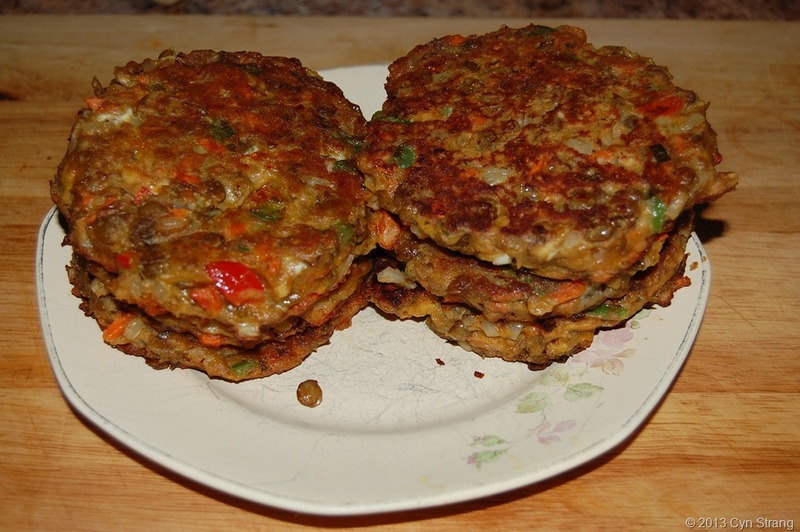 This recipe made me six patties that fit perfectly on a medium sized hamburger bun or as we did, eat it as your protein side-dish that can be served alongside a salad and dinner as pictured below. 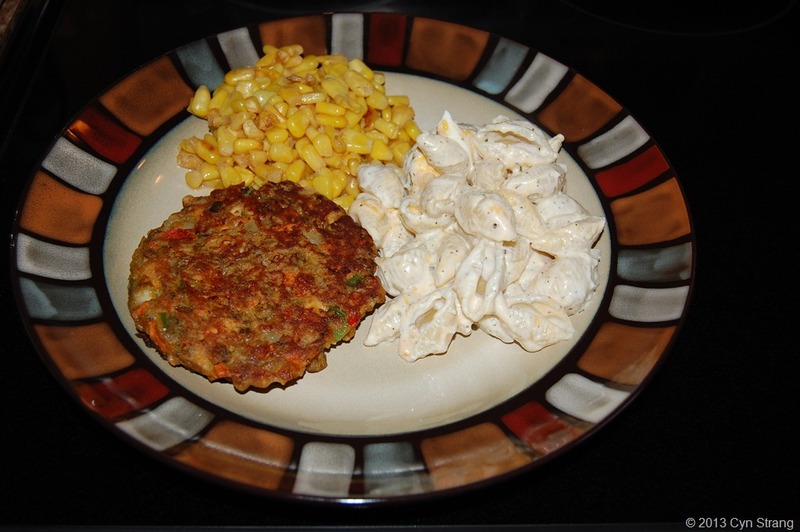 This dinner plate has garlic shells and corn paired with the lentil patty. Many times I’ve gone through the frozen foods section at the grocery store and come home with a single serving of that wonderful brand that makes a vegetable lasagna. Throw it in the microwave and zap it for a few and then enjoy every morsel until its gone. Unfortunately, lasagna can be a not-so-good food if you aren’t careful about what goes into it. I’ve been messing around with my recipes for years tweaking here, substituting a little there, trying to make them healthier but keep all the taste and textures that we all love. This is my version of that frozen entrée! This is a fabulous way to get veggies in for your otherwise really picky eaters! The recipe follows at the end of this post. Take a whole pack of fresh organic baby spinach – like the packs you find in the salad and produce section of your store. 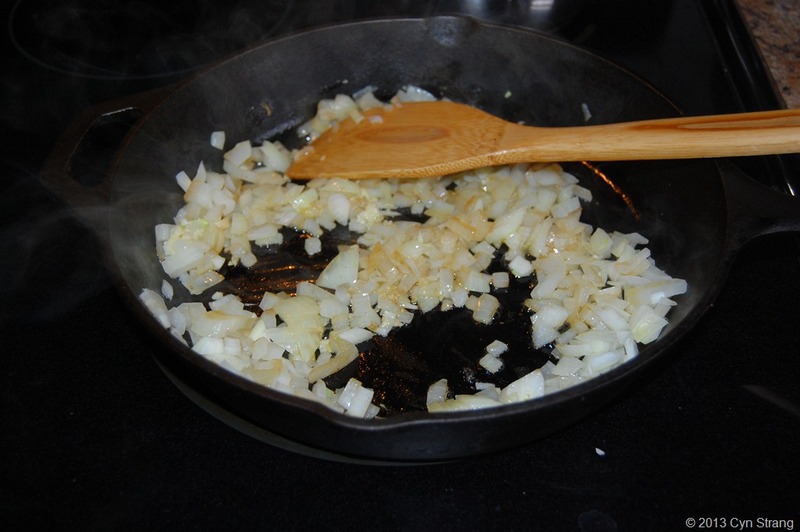 Sauté it with finely diced onion in a little extra virgin olive oil. Take a block of tofu – I used organic extra firm tofu and pulsed it in the food processor with the “s” blade until it was smooth like ricotta cheese. It gets really thick just like the real ricotta. Transfer the spinach mixture and the tofu mixture to a bowl. 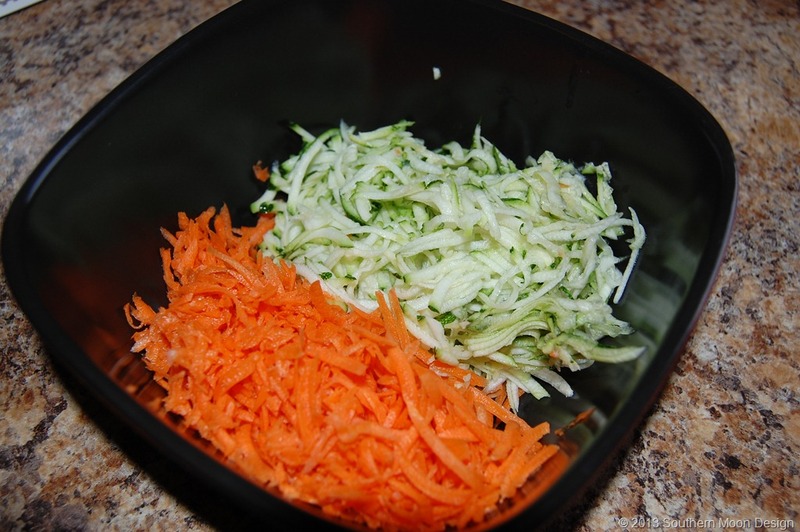 Add the grated carrots and zucchini, sea salt, onion powder, garlic powder, Italian seasoning, and parsley flakes. Now time to layer the noodles! 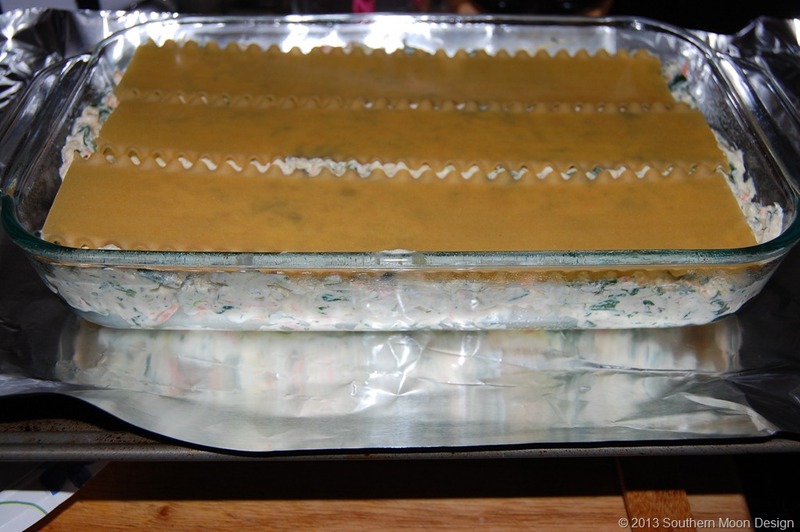 You can pre-cook your noodles, but I am far too impatient for that when it comes to lasagna! I just put enough sauce in to cook the noodles while the dish bakes. Works good as they come out perfectly al dente. 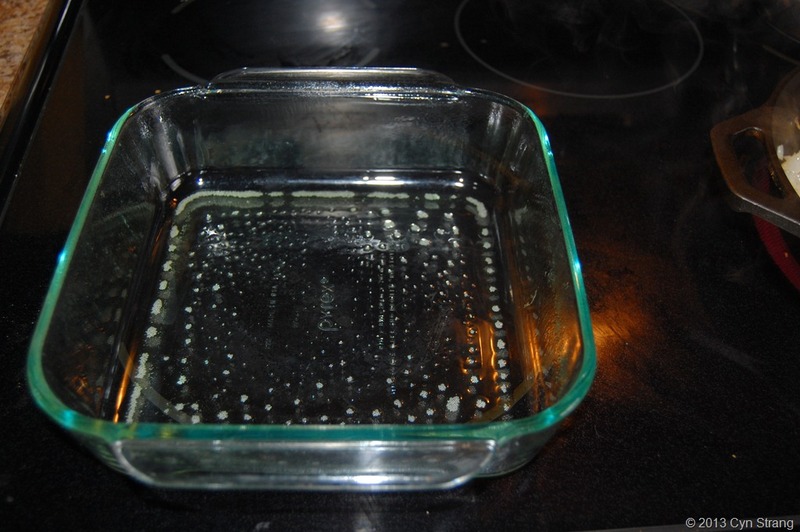 Spray your baking dish with non-stick spray coating the bottom and sides well. Start with a layer of noodles, then filling, shredded skim mozzarella, pour some white sauce (recipe at end of this post). Then repeat your layer until you run out of filling. This made two layers which is perfect for us. Finish off the top by pouring the white sauce over the noodles covering well. Then top with Panko bread crumbs and a little shredded skim mozzarella. To help with potential baking overflow, I’ve place my baking dish on a cookie tray lined with foil. This makes for easy clean up and helps keep my oven cleaner. Bake at 350 degrees Fahrenheit until bubbly and the Panko has browned. Let set for 10 min before serving! Add about 1-2 cups un-sweet nut milk or skim/low fat milk. 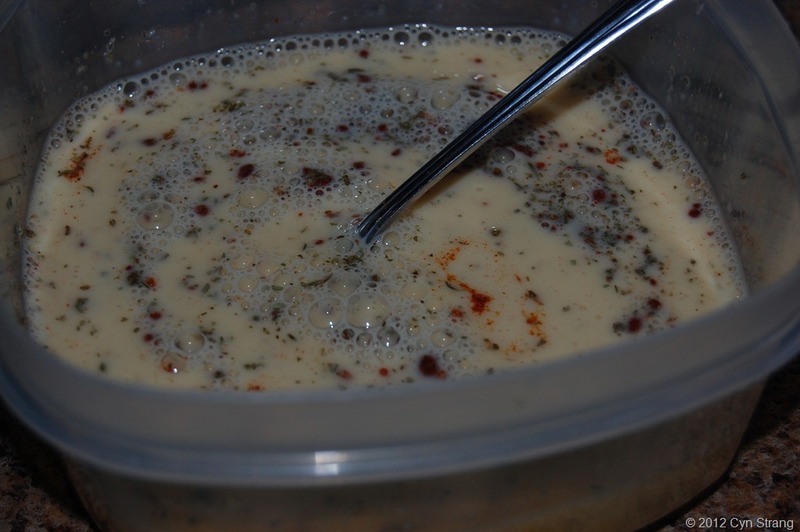 Make into a thick white sauce, constantly stirring with a whisk. Add 1 cup shredded Cabot Extra Sharp Cheddar and Monterrey Jack. Continue to whisk until the cheese is melted. Pour over the noodles as indicated above. It’s a “Pizza” Tomato Pie! Cooking shows are some of my favorite and in order to catch them, I have to DVR all the time. They are full of great ideas and some of my favorite shows include Pioneer Woman, Not My Mama’s Meals, French Food at Home and Luke Nguyen’s Vietnam. I decided to make is more like a stacked pie sans crust. Stack them in a colander in a single layer and sprinkle lightly with sea salt to drain for about 10 minutes. I really had quite a bit more than the picture shows! You can use a really large colander and stack a lot at one time. Grabbing the Panko bread crumbs I started stacking starting with a layer of tomatoes sprinkle the Panko and cover generously, stacking until you run out of tomatoes. Once stacking is complete, pour your egg mixture over the entire dish until it fills up to the top, added shredded cheese to the top: Cheddar, Pepper Jack, and Havarti. Bake at 350 degrees Fahrenheit until the cheese is bubbly and slightly browned. Remove from your oven and let set for about 5 minutes before serving. I took a spoonful of this out and tasted it. It was absolutely delicious! The Pepper Jack cheese gave it just enough bite. Pair it up with grilled chicken, steak and salad or any vegetarian dishes for a tasty summer meal!